Renter friendly display ideas for art to keep your landlords happy. These easy tips will have you thinking outside the box for rental decor dilemmas with creative solutions. Hey there my friend. It’s be awhile since I’ve shared a post just for my renting friends but these easy decorating tips can also be used by home owners trying to avoid holes in walls. So keep your landlord (and yourself) happy with easy rental friendly decorating ideas for displaying art. There are so many challenges in rental living that we’ve personally experienced living in the USA and overseas that I’m constantly focusing on finding creative solutions. One of the biggest ones is putting holes in the wall can cost your deposit money. Some landlords even request no holes in their contracts. But renters should should be able to create a personalized space that everyone can enjoy. All you need is a little creativity and fresh ideas and you’ll be displaying your art and picture collection in no time. An easy go-to is command strips. Make sure to buy ones that match the size and weight of your art. Once you stick them on, it’s a good idea to press the art frame to the wall for a few seconds. Styling tip: To avoid art “floating” on the wall, hang small pieces together with the center being eye level. Look for smaller wall space like the space between a window and a door, a tall piece of furniture and the corner, etc… These tips will give your art displays a well designed look! Lean art on the floor. If you have large pieces and not enough wall space or they are heavy, create a statement by leaning it on the floor. Place it next to a piece of furniture or layer it with other art pieces. Styling tip: Fill with the space above with small art pieces hung with command strips. Learn art on shelves and furniture. A lovely home for those large mirrors and pictures is usually on top of a tall boy, built ins, and fireplace mantels. Bonus, dressers and chests make great storage pieces for any room in your home and are another opportunity for displaying wall decor without having to hang it when the furniture is against the wall. Styling tip: Try leaning two different size pieces layering the small over the larger one a couple of inches. Add a sculptural decor object off center to complete your vignette. Get creative with hanging materials. If you have a picture rail or wood trim that you feel comfortable using a small nail. Staple twine or leather string to the back of the picture frame at the length you want the picture to be hung. Suspend the art from the nail for an unique and renter friendly display. Styling tip: If the art is hung higher, place an accent chair, stool, or tall houseplant underneath. Mix art with your books and decor accessories on your bookcases. 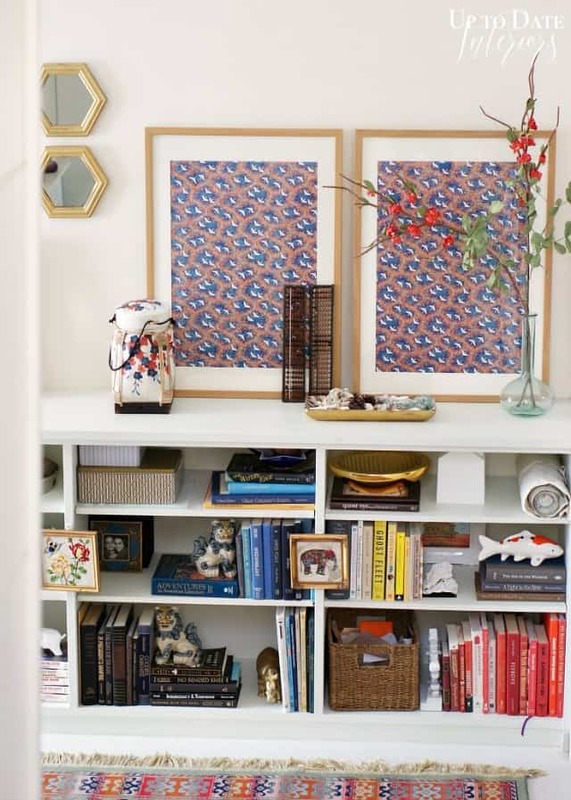 Try leaning art in a zig zag pattern in your bookcase, style the open shelves with books and decor items. Styling tip: If you’re using your bookcase for more than books, use the rule of thirds. One third decor, one third books, and one-third art. Hang your art on the front of built-ins or bookcases. Use those command strips to display small to medium size art on the shelf/side corners. It’s a great way to add more layers and to keep your decor interesting! Styling tip: Use art pieces in consistant colors or styles. If you have large built-ins or bookcases, hang art every other shelf. Hang art on other furniture. Use a “s” hook to hang art pieces from metal or wood frames, poles, and molding/trim that has an open top. This is a great way to add a focal point to a piece of furniture. Add personal pictures, postcards, and small art prints in a tray and display on your coffee table or table top. Use your mementos for conversation starters. Corral them neatly in a shallow dish or tray to easily reach them for story telling. If you can prop up a piece of art, you can turn just about any spot into a beautiful vignette. Look around your house for an unexpected spot on a stool in the corner, or a chair that doesn’t get used very often. I adore resting a piece on a piano music stand for an added detail. Hang art on a door with a wreath hanger. Wreath hangers aren’t just for wreaths. Adorn an interior door with a lovely print or painting by hanging it. Styling tip: To create a hanger on the back of the frame, use twine, ribbon, or wire, and staple it to the frame or attach to existing hangers/hooks. Have you tried any of these tips? Do you have a favorite way to display art without damaging walls? Leave me a comment and let’s chat! You might also enjoy these renter friendly posts! Thanks for this advice for displaying art. You mentioned it could be a good idea to lean art on shelves or furniture. it sounds important to first know how big the piece will be so you have a better idea what an ideal location will be for it.